Filling up our baby registry was a little overwhelming. I think I just googled baby registry checklist and went off a few of them. There were some things that I was like, “Nope, don’t need that”, but for the most part it helped me feel like I wasn’t forgetting anything. There are so many things for babies! Now that we’re almost to one whole month of having our baby girl here, I figured I’d share some things we have that we love. Owlet Smart Sock 2 – This thing is amazing and probably tops my list of baby must haves. 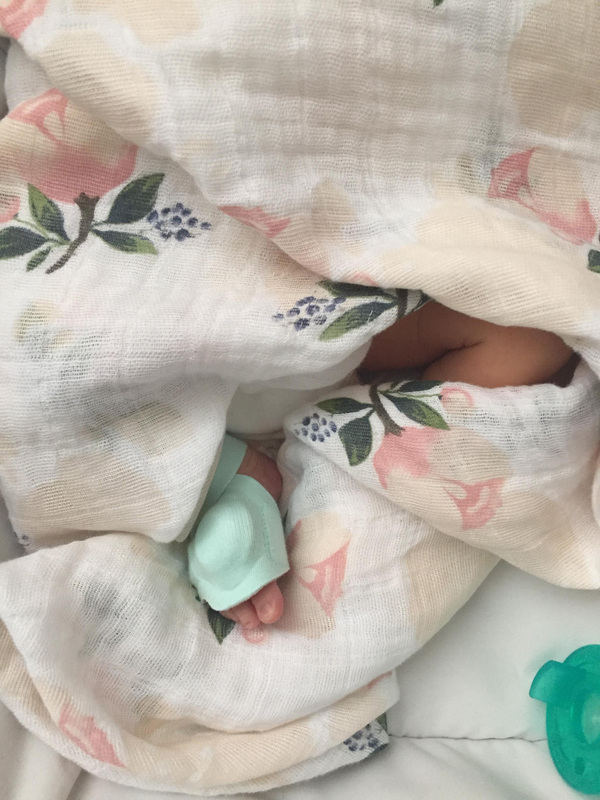 I didn’t actually plan on buying one of these because they are pretty pricey – but 9 scary days in the hospital after Emilia was born completely changed my mind. It was about halfway through our hospital stay that I told Marty we need to buy one of these, so he ordered it right away and it was at home waiting for us when we finally got to take baby girl home. While we were in the hospital her heart rate and oxygen were constantly being monitored (oxygen issues were the reason we were there so long) so the fact that the Owlet monitors both of these really gives us peace of mind. And honestly, with a newborn, I don’t think you can put a price on peace of mind. The sock is cute, very adjustable, and doesn’t seem to bother her at all. (She had monitors on her feet at the hospital anyway.) The base station (which charges the sock) is small and sits on my nightstand. It will notify you (make noise) if baby’s levels drop out of the normal range, if the sock comes off of baby, etc. My favorite part though, is the Owlet app, which you can open at any time and it will tell you baby’s heart rate and oxygen level. I find myself opening it up at night sometimes and breathing a sigh of relief at her good levels. The app will also notify you just as the base station does. 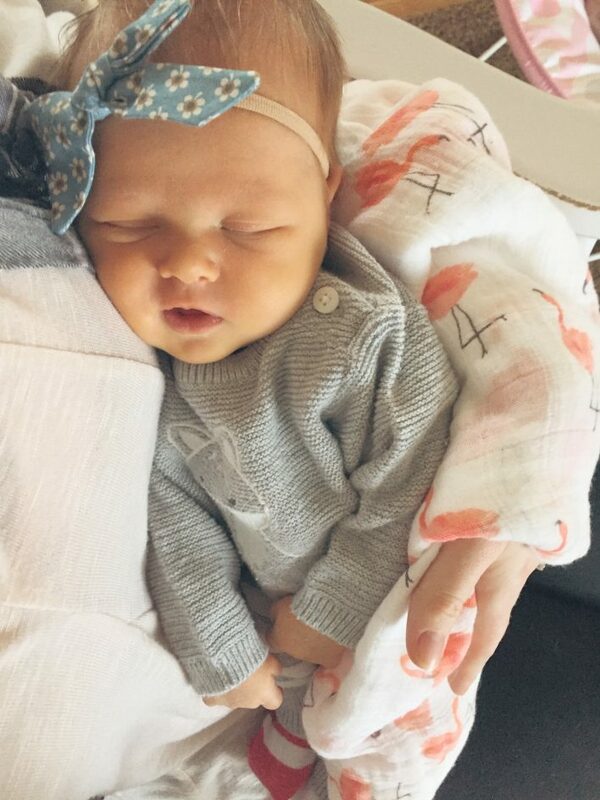 I hear so many mom’s talk about how they would constantly check to make sure baby is breathing (SIDS is such a scary thought), but with the Owlet – I feel absolute peace of mind without having to get up to see her breathing. Boon Grass Counter Top Drying Rack – I saw these years ago and always knew I would want one when we had a baby – they are awesome! I love the way it looks on the counter, and we use it all day long. We also have one of the twig add-ons, which is perfect for the smaller parts of bottles and pump parts! Spectra S2 Breast Pump – I’m not the best at purchasing these kinds of things. I just don’t have the patience for sifting through reviews and feeling confident about making a good choice. BUT. I married someone who is the bomb at it! So, things like the car seat, breast pump, etc I completely left up to him. Yep, that’s right – I had my husband pick out my breast pump. In fact, I didn’t even look at it online – he just ordered it and that was that. Since we were in the hospital for so long with Emilia, I used a Medela pump provided by the hospital. I had never even looked at my pump, so I had no idea how it was going to be making the switch when we got home. I love the Spectra so much more than the Medela! It’s smaller, prettier, quieter, and pumps better. It has a timer on it, so you can see how long you’ve pumped for, plus it has a nightlight button which is so handy when I pump in the middle of the night and don’t want to disturb the babe. Pumping is no fun, but at least I like my breast pump! Back Seat Baby Mirror – Speaking of peace of mind, having a mirror in the car so we can see baby girl when we’re driving is a must. We’re really happy with the one we got, but I’m sure any back seat mirror would work. Swaddles – I love swaddles!! We have around 9 or 10 and use them all the time. We swaddle baby E in them at night, and we use them to cover the car seat when we take her in places (great for keeping nosy strangers from fawning over her). Plus I lay one down on our bed or the couch and cover her with another when she’s relaxing with me. We’ve got a few different brands but I think Aden and Anais and Little Unicorn are my favorites! Medela Quick Clean Bags – These are so easy to use, and we use them all the time. They are great for keeping our bottles and pump parts disinfected! Gahhhh I just love her the mooooost!